How Does Stress Raise Cholesterol Levels? Stress leads to cholesterol, which leads to clogged arteries increasing your risk for a heart attack. Stress is a normal part of life, but it has profound physiological effects such as an overproduction of cholesterol. This high level of cholesterol can clog arteries, and it can increase the risk of a heart attack. Understanding how stress increases cholesterol levels can help you realize how important stress management is in your life. When a stressful situation occurs, a gland near your brainstem called the hypothalamus secretes the hormones, adrenaline and cortisol. These hormones raise your heart rate, blood pressure, and increases blood flow to your brain. This process prepares your body to either flee from the stress or fight against it. Adrenaline and cortisol signal the liver to produce cholesterol. 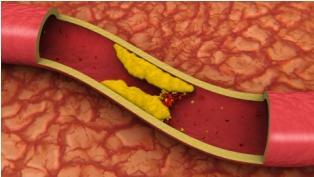 Cholesterol is a fatty substance that provides your body with energy, and repairs damaged cells. The energy helps you with fleeing from or fighting against the stress. However, if you don't retreat from the stress or fight to lower it, your body continues to produce adrenaline and cortisol, which leads to an overproduction of cholesterol. Since this energy from the cholesterol is not used, the extra fat substance begins to accumulate in arteries, which can lead to heart disease. Cortisol also produces sugar, another energy source. When this energy is unused, the sugar turns into triglycerides. These triglycerides are fatty tissues that usually end up in the abdominal, increasing the risk for heart disease. Researchers continue to search for information about stress and cholesterol levels. With so many people experiencing large amounts of stress every day, the more they know about its effects on their emotional and physical health. Understanding the connection between stress and cortisol can lead to the manufacture of drugs to counteract the problem, and it can prove that stress management is imperative. In a study published in the Journal of Clinical Endocrinology and Metabolism, researchers tested cortisol levels in urine samples. The group with the highest levels of cortisol in their urine samples was five times more likely to die of cardiovascular disease. Researchers at The University of Western Ontario have found that hair strands show cortisol levels before a heart attack occurs. While cortisol can be detected in secretions such as urine, serum and saliva, it only measures acute stress not chronic stress. By looking at how hair grows, the researchers can take a strand to measure the level of cortisol it has. This helps determine how much stress the person has been under, and how the stress relates to cholesterol levels. For example, hair grows about a centimeter per month, if a researcher takes a strand that is six centimeters long and tests the cortisol level, the researcher will know how much stress the person was under in six months by the level of the hormone. More cortisol indicates high level of stress and a lower amount of the hormone indicates a lesser level of stress. While stress is a factor in cholesterol levels, it's not the only factor. Unhealthy eating and inactivity also contribute to cardiovascular disease. Therefore, eating healthy, exercising and stress management are effective ways to lower cholesterol. It's also important to consult your medical professional for routine cholesterol testing and medication management.